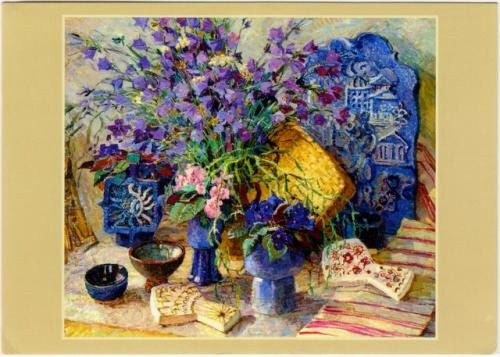 Postcard BY-1563582 from Belarus shows a still-life painting from a past exhibition the Wheel of Time. Valerian K. Zholtok (1919-2000) at the National Art Museum of the Republic of Belarus. Valerian K. Zholtok was born December 13, 1919 in Zhlobin Gomel region in Belarus from a family of railroad employee. She graduated from the Vitebsk Art School in 1939, and had received many awards throughout her career. Many of her works are in collection of the National Art Museum of the Republic of Belarus, the Belarusian Union of Artists, Museum of Modern Art in Minsk, Belarus, and other institutes and individuals in UK, USA, Italy, Poland, Romania, and Japan. Many of the plants in her paintings were grown by her own hands.